Matthew: This episode annoys me, in a few big ways. I'll get to those in a bit. But I will praise this episode for what it does - it's a pretty decent sci-fi idea to have cast members portray aspects of another character's personality. It was a good idea in "Frame of Mind," a good idea in "Masks," and a good idea in "Distant Voices." Wait, you say - two of those episodes sucked, and I'm praising this show for having a good idea that's been done three times already? So, yeah. This is faint praise. The premise could be interesting, but almost always bogs down into an mess that fails to entertain. Why? My first criticism is the propensity of such a story towards self indulgence, both in writing and acting. Writers are just salivating over the idea of creating new characters, and they get to do a whole bunch of them, here. But you know what? It's hard to create a compelling character, especially in only a few minutes of screen time, especially when you know they're going to just go away again by the end of the show, and especially when they take time away from characters I already kind of care about. I'm not saying it can't be done. I'm just saying it wasn't done. Maybe if we had focused on only one persona, it would have been better (I'd vote for Curzon, given that he's the most established in previous stories). Kevin: From a story standpoint, this seems to contradict what we learn in "Dax." It does in fact seem possible to excise a specific past host without harming the current host or symbiont. I also question how it would work from the past host perspective. Is it like being alive again? Does Jadzia now have a new memory for each host of experience her zhintarra? I would be happy with whatever explanation they give for this, I just wish they had done so. That aside, I like the idea of the episode, and maybe it would have worked better had they kept it more focused and referred to some of the hosts rather than show them. Especially for the earlier ones, it's just checking off a list, so I know not to get invested. Particularly for a character like Leela, whom I am told but not shown is a friend, it falls flat. It separately annoys they don't write the characters as friends after this episode either. It's just lazy writing to cover all the hosts on the list. Matthew: My other huge problem with this show is the basic idea of memories in a symbiont becoming some sort of autonomous being. It might have been OK with some of the characters, but it veered way over the line with Sisko/Joran and Odo/Curzon. How can memories become murderous in the person of Sisko (and why would they leave him alone with Jadzia if they could)? How can echoes of Curzon in a worm have desires and hopes that would hijack a fully autonomous being? It was horribly explained and ended up seeming arbitrary and stupid in order to serve the plot. Wouldn't Jadzia know Curzon had the hots for her if she had access to his memories and personality? How could memories within Jadzia Dax be withheld from her? Do the personas in the symbiont have the ability to hold things back, or is the symbiont doing the withholding? Do they have independent feelings?It just makes no sense given what's been established in previous stories. In no way has it been implied that the actual consciousness of previous hosts survives, but this episode strongly implies it in order to manufacture drama. It irritated me to no end. Kevin: I suppose I could buy that idea that there are things in Curzon's mind that the symbiont might not take with it after Curzon's death, but that wouldn't explain how reanimated Curzon knew them either. I could even conceive that a subsequent host would not have a perfect understanding of their previous hosts feelings. I've lived in my head my whole life, and sometimes I couldn't articulate why I feel a certain way. Also, I could see non-Trill hosts succumbing to the influence of the Trill host more easily. Again, I think there is an explanation here, it just needed to be made more fully than it was. Also, seriously, why even bring out Joran? Did she also meet Verad again just for kicks? Matthew: Criticism aside, the basic story idea of Odo merging with Curzon and Curzon not wanting to leave was interesting. I hate how it was arrived at (through the symbiont, that is, for reasons mentioned above), but it's an interesting story idea (which has also been done before, it should be said, in better episodes like "The Schizoid Man"). Nonetheless, I have a very difficult time believing Odo would want to give up his individuality, especially after how he was treated early in life, and how he jealously guards it against his fellow changelings. Kevin: I see your point, but this bothered me less. I could see Odo at least momentarily falling to Curzon's persuasiveness. Also, given he also has an untenable crush on a colleague, I could even see sympathy there. Again, they just needed to explain it out loud. I did like the character moment at the end though, where both characters had gained an insight into each other's unique existence. Actually that would have been a great episode. They could have started in reverse with Odo and Curzon and spent the episode exploring it. One scene I did love unreservedly is Sisko's appraisal of Curzon and his friendship. Given this friendship exists pretty much in Sisko's memory, I think it always played well and as a real thing, and seeing him have such a nuanced and honest view of a mentor figure made the friendship more interesting, and Sisko a more credible leader, given he can assess even the people he is close to that way. Matthew: The B story yet again had nothing to do with the A story. That said, I mostly liked it. I really liked Rom standing up to Quark, it was another beat in reestablishing the Ferengi as somthing other than caricatures, and Rom as something other than a feeb. I thought it was sweet that Rom ordered a custom uniform for Nog, and I liked Quark's reactionary attitude. This story also introduced root beer, which served as a nice metaphor on other occasions. Kevin: I guess we are just going to have to be less concerned about thematic connection between A and B plots, or we're just going to make ourselves mad. Rom standing up to Quark, particularly in light of him doing so in "Family Business," makes sense and is a nice step for the character. I like that they did not drop the Nog plot, and ultimately, I think Nog gets one of the best arcs of the series. The little touches like the uniform and the root beer are great. I also like things like changing the testing parameters as part of the stress test. It makes sense and reads as less insane than intentionally exposing him to his greatest fears. Matthew: This type of story can lead to awful overacting. And it did here. I didn't like Sisko as the Joran persona at all, I was annoyed by his voice. But Avery Brooks was not the only offender. I was annoyed by Kira's accent and O'Brien's nasal voice. I absolutely HATED Siddig El Fadil's voice and characterization, it was far too reminiscent of his mirror universe character.Chase Masterson's gymnastics veered really close to Trek Juggling and Acrobatics, my most hated of annoying trek things. 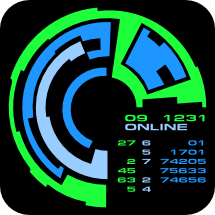 Were all of Dax's previous hosts goddamned weirdos with uncontrollable idiosyncracies? How could anyone have listened to Joran talk for more than an instant and not said, "yeah, let's not stick the worm in the serial killer." Kevin: I was not bowled over, but I was not as annoyed by Kira and O'Brien as you. I get the sense the writers are writing Dax as a bit of a black sheep, even among Trills, so the fact that they are quirky and contradictory makes a bit of sense. Bashir was too "Mirror Bashir." More than anything, except for Curzon and Audrid, I didn't get a sense of the internal life of the hosts, which is kind of the point of this writing exercise. The production staff seemed to be feeding Brooks on this one. They loved this interpretation, only asking him to tone it down from being even creepier, so this may not be his fault. Matthew: In the Dax portion of the story, I was annoyed by basically everyone but Rene Auberjonois and Armin Shimerman (surprise, surprise). They embodied their personae without trying to hard to be different, affecting some weird voice. Shimerman was oddly effective as a maternal, female persona. 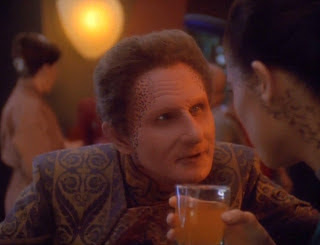 Auberjonois did a great job at Curzon, really giving us the charm, which shows us how different his Odo persona is, too. Terry Farrel was quite good in advocating for the return of her Curzon memories (or consciousness, or whatever). Brooks was awful in his Joran scenes, but was great in his scenes counseling Dax. Max Grodenchik was great, finally ditching the simpering tone and the squealing, and seeming like a forceful, caring character. Kevin: Like her performance in Invasive Procedures, Terry Farrel can really portray a vulnerability around Jadzia herself that is really affecting. I agree that Shimerman did a great, subtle job her, and the writing actually bore it out, unlike, say, Profit and Lace, where it was painful. I enjoyed watching CurzonOdo interact with Quark. It mined their previous scenes really well to land the joke perfectly. Matthew: This is a bottle show. That's not necessarily a bad thing, but here it was characterized by a bunch of dimly lit rooms with incense burning or something. Boring. There was an optical effect of Jake knocking on the shuttle window, which was pretty well done. In a sea of relatively boring visuals, we did get the best morphing effect of the series thus far, with Odo taking on Curzon's features. This is pretty much all I've got on this aspect of the show. Kevin: I thought the energy effect of the transference was well achieved, per se, but found it an odd choice. I think it should be more like a mind meld in terms of happening internally. The gas effect was a tad much. Matthew: This story's structure was a mess, not getting to the actual point (apparently the Curzon bit) until after 30 minutes in. The mechanics of the persona transference were contradictory and inscrutable. The acting was extremely uneven.The B plot was fine, but still unrelated to the A plot (or the A-E plots, if you'd prefer). It's just a mess and I don't particularly enjoy it. It's a 2 for me. Kevin: The Curzon/Quark, Curzon/Jadzia, and non-JoranSisko/Jadzia scenes have enough life for me to just nudge this into a 3. I enjoy watching it for what it is. It could have been better and more thought out, but this still feels above a 2. That makes a total of 5. I really wanted them to portray Joran as a person, and they didn't. Even creepy murderers don't spend their lives 24/7 (26/7?) being creepy and murdery. I wanted them to show him as an actual person, with a real personality that's got shades of grey on both ends of the spectrum to make up a viable character. I wanted him to be charming and pleasant, and give Dax something to be in conflict about when she tries to fit him into some category or box in her head. I like Avery Brooks, even when he's chewing scenery. I know I'm in the minority there, but I know people like that. His scene as Joran was the one scene where even I could not overcome my feelings of, "Really, Avery? That's the acting choice you made?" At least they didn't give Joran to Bashir. I have come to appreciate Brooks much more on this viewing. I used to think he was just a ham. In a quiet scene, he's actually quite good. Very much agreed on Joran in general. I was befuddled by this episode's structure. They spent ten minutes on boring hosts, then shot through the Joran scene, and left almost nothing for Curzon, which it seems was the actual point of the show. This one needed to go back to the writer's room to get re-broken.